DULLES, Va.Aug. 26, 2017-- Orbital ATK (NYSE: OA), a global leader in aerospace and defense technologies, announced its Minotaur IV space launch vehicle successfully launched and placed into orbit the U.S. Air Force s Operationally Responsive Space-5 (ORS-5) spacecraft on August 26, 2017. The Minotaur IV launched from Cape Canaveral Air Force Station s Space Launch Complex 46 (SLC-46), which is operated under license by Space Florida. This mission marks the 26th consecutive successful launch for the company s Minotaur product line. The rocket s first stage ignited at 2:04 a.m. (EDT). Approximately 28 minutes later, the Minotaur IV deployed the ORS-5 satellite into its targeted low inclination orbit 372 miles (599 kilometers) above the earth. From this orbit, ORS-5 will deliver timely, reliable and accurate space situational awareness information to the United States Strategic Command through the Joint Space Operations Center. This was our first Minotaur launch from Cape Canaveral Air Force Station, demonstrating the rocket s capability to launch from all four major U.S. spaceports, said Rich Straka, Vice President and General Manager of Orbital ATK s Launch Vehicles Division. 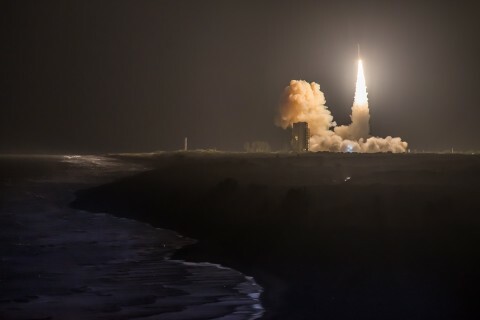 With a perfect track record of 26 successful launches, the Minotaur family has proven to be a valuable and reliable asset for the Department of Defense. Orbital ATK has launched nearly 100 space launch and strategic rockets for the U.S. Air Force, said Scott Lehr, President of Orbital ATK s Flight Systems Group. We re proud to be a partner they can count on. The ORS-5 launch was the sixth Minotaur IV flight. The Minotaur IV is capable of launching payloads up to 4,000 lbs. (or 1,800 kg.) to low-Earth orbit. This mission s Minotaur IV configuration included three decommissioned Peacekeeper stages, an Orion 38 solid-fuel upper stage and an additional Orion 38 insertion stage for the payload. The Minotaur rockets are manufactured at Orbital ATK s facilities in Chandler, Arizona; Vandenberg, California; and Clearfield and Magna, Utah. The ORS-5 team is led by the Space and Missile Systems Center s Operationally Responsive Space Office, located at Kirtland Air Force Base, New Mexico. The Massachusetts Institute of Technology Lincoln Laboratory in Lexington, Massachusetts, is the ORS-5 prime contractor. The 50th Space Wing at Schriever AFB, Colorado Springs, Colorado, operates the ORS-5 system.